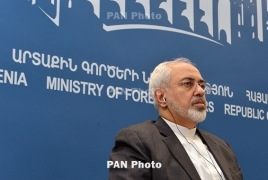 Iran says U.S. "accountable for crimes against humanity"
PanARMENIAN.Net - Iranian Foreign Minister Mohammad Javad Zarif said in a tweet on Thursday, November 8 that the United States must be "held accountable for its crimes against humanity", IRNA reports. Zarif tweeted: "Just as with Yemen, @SecPompeo blames Iran for unlawful U.S. sanctions preventing Iranians’ access to financial services for food and medicine. Naturally, we will provide them for our people in spite of US efforts. But US is accountable for crimes against humanity re Iran & Yemen." On May 8, U.S. President Donald Trump pulled the country out of a nuclear deal struck by Iran and six world powers known as the Joint Comprehensive Plan of Action under which Iran agreed to curb its nuclear program in exchange for lifting of sanctions. The U.S. president also reinstated the sanctions already lifted under the JCPOA and vowed to impose the highest level of economic ban on Iran. The second round of U.S. sanctions against Iran targeting Iranian oil exports, shipping, aviation industry and banking affairs went into effect as of Monday.